If there is one thing that every surfer/paddleboarder knows about ISLE, it is that they make quality boards. From the smallest to the biggest board, ISLE has managed to pump out some of the most remarkable inflatable boards in the industry which consequently resulted in making it a go to brand for beginning and professional surfers. Indeed, the ISLE 12’6” is but a manifestation of the brand’s accumulated progress which embodies the needs and requirements of a large range of users. Not only is this board compatible with a lot of profiles but it’s also one which accumulated a majority of positive reviews so far. So, let’s find out why! Undeniably, the size of a surf / paddle board is central to your purchase because not only can it impact user comfort but even the board’s performance and sustainability. In the beginning, there is length which is a determining measurement as it primarily decides the exact category of people who would be compatible with this board. Hence, at 12 feet and 6 inches, the ISLE at hand is certainly not made for children but is still compatible with larger teens and most adults generally. Further, the board’s extra length will certainly come handy in terms of straight tracking which will be further emphasized in the performance sub-title. Personally, I believe that the width of the board is rather critical because it can either make it extremely easy for you to handle it on water or give you a hard time. Accordingly, the ISLE 12’6” iSUP at hand decided to go with the generic 30 inches which is common on most if not all beginner boards. This makes the board a lot more appealing to beginners as you’ll be capable of maintaining solid balance through wild currents. Thickness is also one of the more critical dimensions as it entails quality and performance in various ways. For starters, the board’s thickness can make the difference between a dry floating board and one which is constantly submerged under water when pushed a little more than its capacity. Hence, the company decided to go with 6 inches on this model as it’ll make sure you stay high and dry (in the good sense) and prevent the board from flexing at the center under a lot of weight. 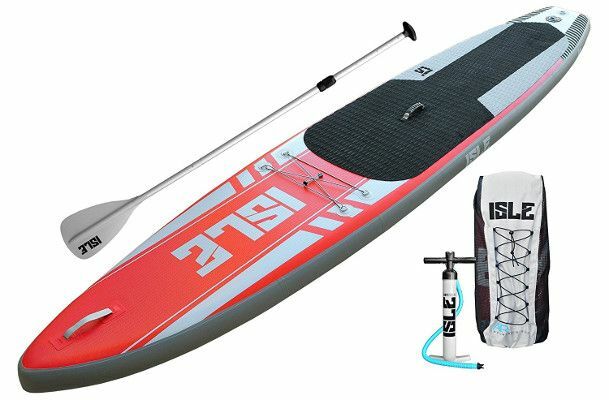 Therefore, the inflatable paddle board at hand is rather perfect for long paddle boarding journeys and touring in general, granted by the length and sharpness of its hull/body. Quality should be your primary concern here as is the case with any purchase you make because inflatable doesn’t often correspond with rigid. Well, except if you’re going with an ISLE because this brand has a notorious reputation for making the toughest inflatable paddle boards in the game and it all boils down to 2 elements. First, the board at hand is not only a work of art but it’s also made out of the toughest material which happens to be military grade PVC. To clarify more, this is the same substance that the army uses to make zodiac boats and some bullet proof vests. Hence, you can completely forget about the possibility of the ISLE iSUP puncturing upon friction with ground or impact with sharp rocks on the shore. Second, nothing is complete without a reliable seal and that’s why the brand goes for a surgical precision drop stitch construction. The stitching pulls the body of the board perfectly together and makes it almost impossible to rip through. The board then goes through a series of tests called torture tests to measure its degree of durability before it’s recreated times unknown. It all starts with the EVA board which makes the board a friendlier platform for beginners and experienced alike. Indeed, the anti slipping foamy pad helps the paddler maintain strong balance while standing up and grants you the ability to steer the board comfortably. D-rings are pretty much an essential now with inflatable paddle boards specifically because unlike surf boards, they are made for longer casual tours and that requires a set of operations. Hence, the board hooks you up with a set of 4 rings connected via a bungee cord, creative a reliable cargo net. Further, the board also features an extra ring on the tail of the board which is meant for safety leash attachment. 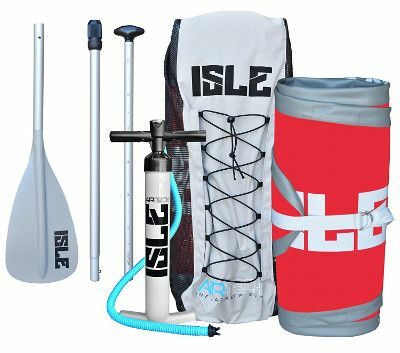 This ISLE inflatable paddle boards and like most ISLE iSUPs comes with a front carry handle to primarily help you carry the board out of the water or get a helping hand carrying it. However, it can also be used to tow / secure the board as well. As for tracking, the board at hand features the best system a beginner can get their hands on. 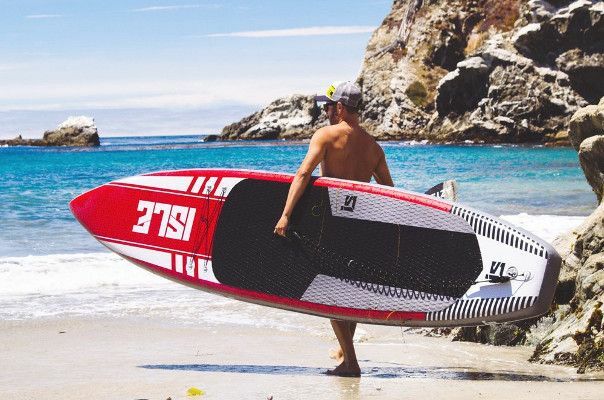 The triple fin tracking system is very practical at it enables to track perfectly on steady water and reasonably on choppy waters, making this board one of the best touring inflatable paddle board on the market. 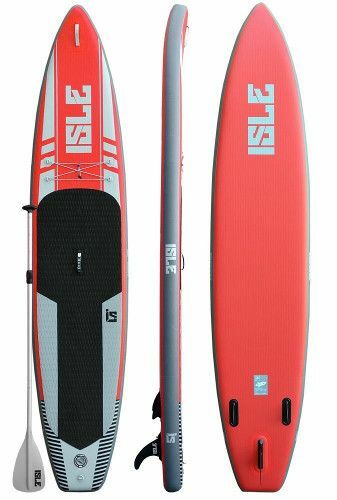 In terms of performance, it is undeniable that there are farther advanced boards out there but for an intermediate inflatable paddle board, it doesn’t really get better than the ISLE at hand. Indeed, this board is designed to be perfectly stable, allowing you to balance yourself at ease even in the toughest circumstances. Also, the tracking system makes handling this board a breeze. The triple fin system will allow you to track straight far easier than you’d imagine while simultaneously enjoying the view or exploring the lake. Also, the hull of this board is specifically sharpened in order to cut through water quickly and achieve an impressive launch speed when compared to similar size boards. Hence, don’t let this big guy fool you because it is quite agile and can pick up speed quickly.